JK Rowling's original text, messy writer isn't she? Until last week I had never been inside the British Library. I have passed by it on the bus and hurled verbal abuse at its ugliness (topically, Prince Charles was very rude about it) but had never ventured inside. Well here’s the thing, inside it is rather wonderful, like a cathedral of academic calmness with a good bookshop. 1 The exhibition has many original manuscripts to look at, if you read a lot, you might get a thrill out of this, especially the hand written ones, there’s something magical about seeing handwritten text; fountain-penned writing has all but disappeared from our lives, seeing the words actually carved onto the very page the author leaned on is close to magical. 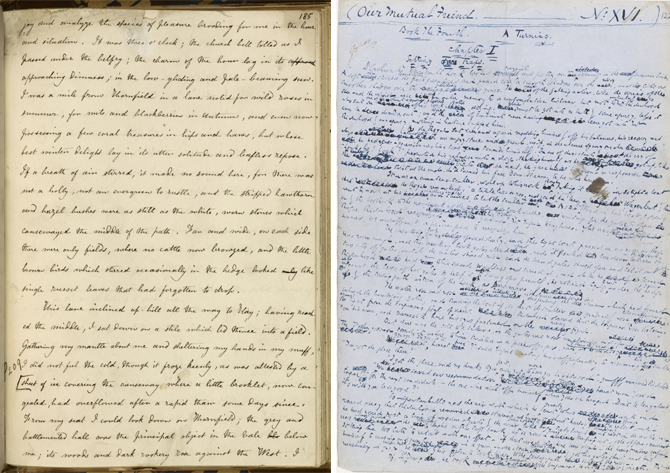 How much more revealing it is to see Charlotte Bronte had a neat, steady hand when writing Jane Eyre but Charles Dickens was a scrawly, messy writer whose blotchy text for Our Mutual Friends must have been a struggle to decipher before setting into print. On the whole, the girls have MUCH neater writing than the boys. 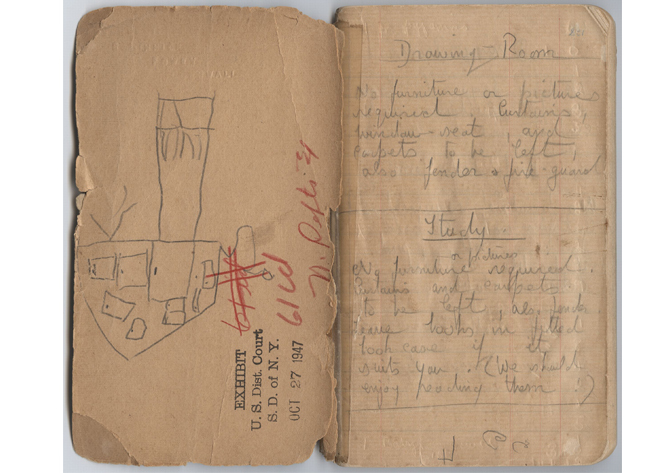 2) You get to see the notebooks the authors wrote on. You know we’re a bit obsessed with notebooks, I was fascinated to see what type of notebooks authors used to write their text in pre computers. Samuel Taylor Coleridge used scrappily drawn mind maps to remind himself of how the plot was going on his plain papered ones, Ted Hughes used lined school exercise books which he loved so much he bought a bulk lot from a school that was closing down. My favourite was the battered pocket notebook that Daphne Du Maurier used to write notes that eventually turned into Rebecca. My only criticism was you are unable to see the front of the notebooks, as they ware displayed open. This could have been resolved by putting mirrors underneath….’helpful face’. 3) The handwritten script for JK Rowling’s Harry Potter and the Philosopher’s Stone is there, complete with crossings out, so if you are a die hard HP fan you can read whole paragraphs of lightly scored-through script that JKR never used. Chapter Six, The Journey From Platform Nine and Three Quarters is on display (above) and you can see JKR was a touch distracted that day, as there are sketches for a pair of earrings in the left hand margin of the A4 lined notepaper. ..I got a distinct shiver being so close to the original manuscript. Another crosser-outer on show is John Lennon, the handwritten words to In My Life have whole paragraphs of unused lyrics to view. 4) You learn so much.We went around the exhibition with two of the knowledgable curators who threw all sorts of interesting facts into the mix (and looked about 17 years old, how did people so young know so much?) such as Tamara Drew by Posy Simmonds was based on Far From The Madding Crowd and Daphne Du Maurier was sued for plagiarism over Rebecca and her dated notebook with jottings saved the day. I’d urge any literary minded souls out there to go and see this, the museum is introducing limited edition, curator-led tours such as the one had, on Tuesdays and Thursdays between 7th June – 5th July (see the website for details). The Writing Britain: Wasteland to Wonderlands exhibition is on at the British Library until 25th September 2012. The bookshop is worth a look too. That is wonderful – I would love to go and see that – my 9 year old boy – who is currently reading all the HP books (currently on book5) – gasped open mouthed when I showed him the JK Rowling excerpt – thanks for sharing. Just wish I could pop over for a look – sadly a 7 and a half hour flight in Jubilee / Olympic year is more than the bank balance can stand – so it’s staying in the heat and three weeks in Sri Lanka for us the British Library will just have to wait for another year !! !